Fenestration Canada reported on association business to its members at the 2014 Annual General Meeting in Winnipeg, and Fenestration Review was there. Read the full report in our Lite Reading section. All Weather Windows has received the Best Overall Workplace (750 Plus Employees) Award at the seventh annual examination of Alberta's Best Workplaces by Alberta Venture. The 2014 Best Workplaces Conference and Award Ceremony took place on May 21st, 2014, with the theme of the conference celebrating businesses that foster and create high performance employees. 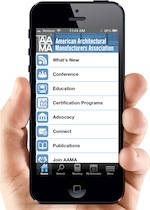 The American Architectural Manufacturers Association (AAMA) will host a weekly webinar series in July, covering a range of topics pertaining to using the AAMA website and social media platforms like LinkedIn and Twitter. The free series is geared toward both novice and expert users of the website and social media. You can see all the photos from Fenestration Canada's four fun- and education-filled days in Winnipeg on the Fenestration Review Facebook page. Were you caught on chip?